In my collection of fall decorations is a plate, gifted me by one of my dearest friends, embossed with this saying: “Gratitude turns what we have into enough.” It was given to me at a time when I really needed to hear just that – you know, one of those messages from above – but continues to be an ongoing reminder each year as I enjoy it adorning my kitchen window sill during the fall. I have always considered myself to be a genuinely positive and grateful person, and have thought that I “practiced” those things in my daily life. But, let’s face it, at some times in life, these practices are easier to maintain than at others. When life is on easy street, it’s not hard to be the most chipper, grateful person in the room. But when life gives you lemons, it’s easy to quickly go to the negative, tuning in to the “why nots” rather than the “thank you fors.” That’s where the practice, with intention, of gratitude becomes a powerful shifter in your life, IF you choose it. As I recently reminded my son, it takes 21 days to form a new habit, (and, in truth, maybe much longer) and it is easy to fall “off the wagon” as we practice. In a great book I read this summer, the Gratitude Diaries, How a Year Looking on the Bright Side can Transform Your Life!, by Janice Kaplan, the author, in simple stories, brought us into her year long journey to practice gratitude every single day, and how it changed her life and the lives of many others she encountered during the process. It began with an intentional act of writing three things down every day – CHOOSING three things that you can be authentically and sincerely grateful for. Some days, those things are hard to find, aren’t they? They take effort. The day I began this writing was one such difficult day in my life. I had been traveling for a couple of weeks, and inundated with life’s struggles, inconveniences and worry as things didn’t go exactly as I had envisioned. My trip to Arizona to spend quality time with my “baby,” now off at college, found me seeing her very little, as she was headed into tech week of a musical production and had many, many rehearsals. The next leg of my trip to a Florida Kindermusik Maestro Conference was clad with airline delays that ensured me missing most of the event, and then, woven in between, a little event called “Hurricane Matthew” arose, and was headed straight for my hometown of Daytona Beach and my family. My 90 year old mother was in our home and my father hospitalized after major back surgery, and I found myself consumed with worry. 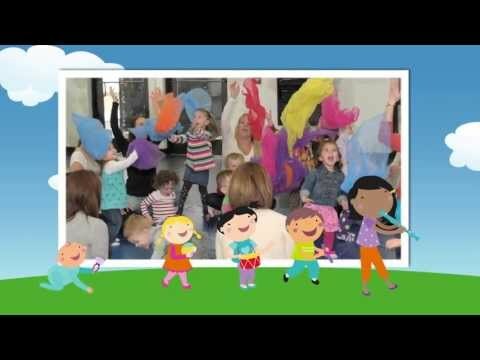 Though, as I look back, I can see that blessings abounded through it all – hugs from some of my favorite Kindermusik educators from all over the world, a homestead with not one stitch of hurricane damage, me being able to be in Florida to help with the clean up efforts, getting my Daddy home from the hospital, etc. – I found myself each day tending to the negativity that crept in from various sources. Once home, the house was gravely quiet, (as my husband was still in sunny Arizona! ), the reality of empty nest syndrome hit hard, and I was grasping to find the grateful me. Of course, I know, in my head, all of those clichés that really do hold true in life – like the one about the tough times not lasting but that tough people do – but until I chose to make a step in another direction, I was stuck. I prayed – something I do every day, but more, of course, when I am stuck – for the help I needed, and I took action, though small at first. Watering my withered azaleas in my back yard, I began to think about them dying and not having lasted even one season, and then, I chose to shift: “Thank you Lord, that you gave me these many azaleas, discovered for only $4.99 each, so that my yard could be beautiful for my daughter’s high school graduation party!” And…..bing! “Thank you that I am home in time to water them while there are green leaves still on them.” And…. “Thank you for the vision that I now hold for how beautiful they will be when they are all in bloom next Spring.” Ahhh. A sigh of relief as I broke the chain; a feeling that arose once I chose to control what my mind tended to in thought. Even though the thoughts I conjured were no more significant than yard “décor,” I could wrap my emotion around them, and I felt a spell was broken! If I could so choose at this low point, and transform how I felt, I could continue the practice. And so it goes. Any habit takes practice, so it is our job, then, to choose what our important practices will be. And think of the results of practicing gratitude with each OTHER! Kaplan dedicates a chapter to that practice within her various family relationships; in fact, that’s how the book starts out, and understandably so, as we most often take our bad feelings and attitudes out on those who are closest to us, don’t we? She spends an entire month finding reasons for sincere gratitude, daily, for her husband, and he notices, and “jumps on the band wagon,” eventually, and their relationship takes a new turn. The next month she focuses on the relationship with her kids, with similar results. We have the control within our hands. It is control over ourselves. Greek philosophers have shared their insight: “a key to living right is understanding that we have power only over ourselves and our own reactions. People are disturbed not by events, but by the views which they take of them.” It’s another way of saying that it’s not what happens to or around you, but how you choose to respond that dictates your attitude, your happiness, and, ultimately, your very life. Among the political arena of late, it saddens me to see the “band wagons” onto which so many are jumping. Though I know that good intentions abound among many who feel passionately about the direction they see our country headed, it seems the inherent “practice” is not in selling the strengths of the one they support but rather in practicing hate and negativity towards the opponent. It’s a vicious circle that seems to be spinning out of control. I have finally chosen not to read or listen to any of it. At quiet times, when I think I see a person whom I respect write something that does not appear to be clad with negativity or emotion, I will read and disseminate it, and, in doing so, have formed my voting preference. And every time I see an inflamed post or story, I say a prayer for love to conquer hate, for focus to shift, for our supreme being to have a hand in it all, and I move quickly on. So, this month, I am asking you to join the “Grateful Gathering.” Won’t you consider finding gratitude in the moments of each day? You can start small, as it has to be something you can be authentically and emotionally feel grateful for! And on some days, you may have to look hard to find what that is! 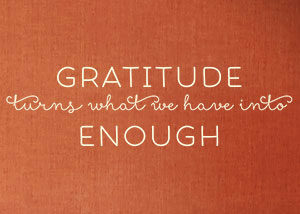 Remember, gratitude has the power to turn what you have into enough – into MORE than enough! I believe that your gratitude path, and perhaps even sharing your intention with someone else, will bring you, and those around you, pleasure, peace and love. And isn’t that what we need to be spreading these days? Next post: Kids – No Hidden Agenda There!